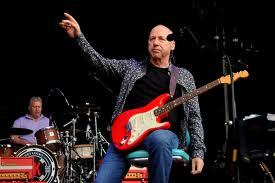 Mark Knopfler is best known as the former head and wristband clad front man of the iconic 80s arena rockers, Dire Straits. After the breakup of the group in the early Nineties, the Scottish ax ace embarked on an impressive solo career in 1996 with “Golden Heart.” His eight album solo discography employs styles from Celtic folk to country. For the composer of “Money For Nothing” one of the most recognizable guitar riffs ever, Knopfler spent a good chunk of the first set performing his solo work as a sideman, letting his wildly capable A List band members take their turns shining out front on sax, fiddle and former Straits member Guy Fletcher’s keys. The crowd didn’t get one of the most recognizable riffs ever, but “Money for Nothing” may have paled in comparison to his performance of “Speedway to Nazareth.” With its blistering runs and juiced up echo, is like mainlining adrenaline for five minutes. The lighting effects attempted to keep up with the torrid pace of this next to last number, but Knopfler’s wizardry left the tech in the dust.